The TruTV show, Adam Ruins Everything, is controversially tackling the subject of “online dating.” Season 2, Episode 4, airing on Tuesday, is titled, “Adam Ruins Dating.” The episode seeks to debunk sites that use scientific methods for matchmaking, the biggest being eHarmony.com. Adam Ruins Everything launches an attack against eHarmony and its founder in the episode. But in the interest of avoiding a larger controversy, the show discloses that the production company that produces Adam Ruins Everything is associated with the parent company of Match.com and OKCupid. Here is a clip from Season 2, Episode 4 airing on August 1, 2017. Adam Ruins Everything is produced by CollegeHumor. CollegeHumor is owned by IAC, which also owns Match.com, Chemistry.com, Plenty of Fish, OKCupid, and eight other online dating services. The clip they released early launches a scathing attack against eHarmony while barely touching IAC-owned dating services. It remains to be seen if the full episode expands its attacks to equally include IAC-owned properties. Oddly, no references to studies scientifically validating eHarmony’s methods appear on the company’s website. Nor was I able to find any published research in an online literature review. There is actually very little available information about eHarmony’s methods, which raised a troubling question in the mind of Robert Epstein, a contributing editor to Scientific American Mind: “Why would a major company such as eHarmony, which claims to have 12 million members, not subject its ‘scientific, 29-dimension’ test to a scientific validation process?” (Epstein 2007). He noted that eHarmony representatives presented a paper in 2004 that claimed eHarmony couples were happier than couples who met through other means, “But this paper still has not been published, possibly because of its obvious flaws.” Four years after Epstein wrote that, there still appeared to be little or no data on eHarmony’s methods. To verify the algorithm’s effectiveness, the critics said, would require a randomized controlled clinical trial like the ones run by pharmaceutical companies. Randomly assign some individuals to be matched by eHarmony’s algorithm, and some in a control group to be matched arbitrarily; then track the resulting relationships to see who’s more satisfied. 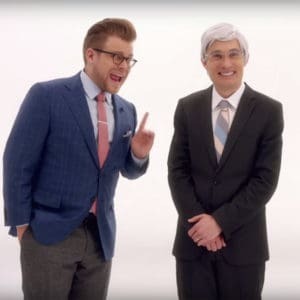 Adam Ruins Everything isn’t new to controversy, which is part of the appeal of the show. The weekly half-hour show takes popular concepts and seeks to debunk them in humorous and creative ways. Adam Ruins Everything has tackled subjects like voting, nutrition, football, death, housing, going green, and immigration. The show generally tries to popularize an unpopular view of the subjects. The full episode of “Adam Ruins Everything: Adam Ruins Dating” airs on Tuesday, August 1, at 10pm on TruTV. Editor’s Note: August 2, 2017: The episode aired last night and more time was spent attacking eHarmony than any other dating service despite the clear conflict of interest. IAC-owned sites were mostly glossed over or not mentioned. eHarmony is the biggest competitor to IAC-owned dating services.